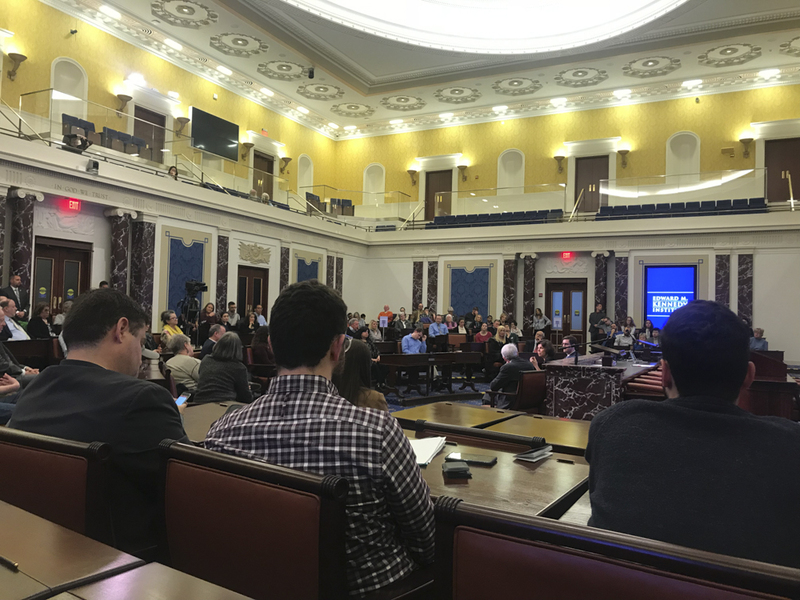 Supreme Court Justice Stephen Breyer and a group of panelists attracted over 100 people to the Edward M. Kennedy Institute for the U.S. Senate Thursday night for a conversation on the First Amendment and hate speech. Hosted by the National Constitution Center, attendees filed into a room staged to resemble the Senate chambers, with the desks set up in a semicircle around Breyer and the three panelists. Breyer opened the discussion with moderator Jeffrey Rosen, president and CEO of the NCC in Philadelphia, with a conversation about the First Amendment and what he wants elementary, high school and college students to know. “It’s there for people’s speech you don’t like,” Breyer said. Breyer went on to discuss hate speech, saying although it can be harmful, he believes it is worse to allow someone to censor and place limitations on acceptable speech. As a Supreme Court justice, Breyer said he sees a diverse crowd of people enter his courtroom. He said the courtroom holds them together so they can logically and peacefully resolve their disagreements. Breyer went on to stress that people will have different views, which he said is OK.
Breyer said he is a supporter of the marketplace of ideas because it creates a place to discuss and debate different views and turn them into action. He went on to explain how judges consider laws that potentially stifle speech. First, he said, they ask what reasons there are for regulating the speech, such as a national emergency. They then ask how much that regulation hurts speech, and consider if there are less restrictive alternatives to solve the issue at hand. The panel spoke afterwards about the First Amendment and hate speech. Panelists included Jud Campbell, a professor of law at the University of Richmond School of Law, Stephen Solomon, a journalism professor at New York University and Nadine Strossen, a professor at the New York Law School. “It argues that the original understanding of the First Amendment would’ve allowed the regulation of hate speech and much speech that the Supreme Court has protected,” Rosen said. Solomon said he disagrees with this view, and believes the framers were more dedicated to free speech. Hannah Cole, 18, of Newton, attended the event per her mother’s suggestion because of her interest in government and politics. Others also came to get a more thorough understanding of the different viewpoints of First Amendment rights, including Rick Fetters, 69, of Assonet. Rosen said she hoped attendees left the event with a deeper understanding of the First Amendment and why the Supreme Court has stressed the importance of “freedom for the thought that we hate,” a sentence coined by Justice Oliver Wendell Holmes, Jr., and why some Americans want to change that view. “I want audience members to make up their own mind about exactly what they think the First Amendment should mean today,” Rosen said. Penny Winn, 60, of Pembroke, said she came with a friend because they were excited by the opportunity to see Breyer in person.